Kampuchea Crossings: Faces: Who Are We Here to Help? Faces: Who Are We Here to Help? 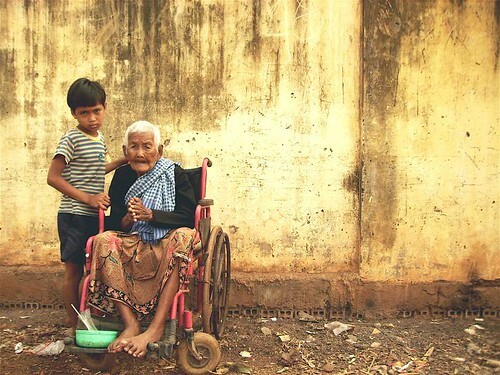 Boy and grandmother, courtesy NGO GRET. This is a family in Kampong Thom who has purchased community health insurance. They are categorised by programmers as "near poor". Health financing efforts are aimed at those below the poverty line and also those just above it who are at risk of a financially catastrophic event. Photo courtesy NGO GRET. Khmer kids from the boat communities just across the Tonle. Their desperately poor communities can be seen from the Royal Palace riverfront. One of the hospitals in the capital city of Phnom Penh, where there is a Safe Motherhood Programme being implemented. Cambodia's very high Maternal Mortality Rate (MMR) of 472/100,000 did not improve between 2000 and 2005 despite millions in aid money and technical input. "His Excellency" Tep Lun, the Director General for Health, Cambodia, visiting a hospital. Yii Chhi are female members of the Pagoda's community, much like nuns in the West. Pagodas can be a place of refuge in the later years, if women have no family left or if they are escaping problems such as an abusive environment. This Yii Chha is wrapping a beetle nut in a leaf. It is chewed much like tobacco, and has a mild stimulant effect. I've only ever seen old rural men and women with this habit, and their teeth and mouth after many years have blackened/ rotted unattractively. Photo by H Kiss. These Yii Chhi don't live in the pagoda, and instead traveled there on the 8th days of the Buddhist calendar to make their offerings. After about an hour of prayer and light activity in the pagoda's Sala Chan (smaller wooden structure on the compound for eating and community activities) they lay down and take a rest. Photo by H Kiss.